Cedar Wash is a ready-to-use wood cleaner for Western Red Cedar, Redwood, Walnut and Mahogany removes resin oils and wood extractives from bare wood surfaces that may interfere with adhesion of Lifeline exterior stains. It is also highly recommended for cleaning Southern Yellow Pine, Douglas Fir, Spruce and Cypress. 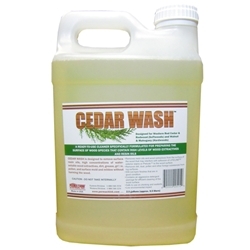 Cedar Wash should be used on bare wood surfaces for prep only. My husband and I had been recommended this product at your TN workshop for our Douglas Fir home. The salesperson we talked to said Cedar Wash would be the best choice. It was a great cleaner for us, but it is specifically used for certain wood species so best to ask a salesperson first, if you have questions. This wood cleaner worked great for what we needed! We built a brand new Western Red Cedar home. A rep from Perma-Chink told us about Cedar Wash and using it before the stain and topcoat was applied.